"Me, too!" I was thinking, having just that afternoon talked to two people whose stories didn't quite match. This may or may not be the type of ferry that NCDOT may or may not lease from Seastreak, a company they have definitely talked to but may or may not contract with. As we all know, the passenger ferry that NCDOT ferry division was having built for them won't be ready this spring, just as it wasn't ready last spring. U.S. Boatworks, the company hired to build the passenger ferry, didn't do the aluminum welds to the satisfaction of safety inspectors. Schadenfreude ensued. The passenger ferry has its detractors on Ocracoke and they aren't the types to say they told us so, but..... Many on Ocracoke assumed that was the end of the passenger ferry concept, at least for the 2019 season. But it's an idea that refuses to fade away. 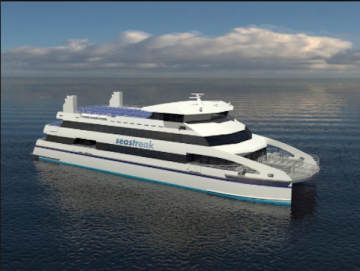 The news came out that Rep. John Torbett, who chairs the NC House Transportation Appropriations committee and is an avowed friend to Ocracoke, had announced that NCDOT would lease a passenger ferry and operations would start in May. One of Tom Pahl's sources was John Torbett. "Torbett told me that the lease is almost in place and it will be here in May." I talked to Bill Rich, former Hyde County manager, who still does consulting for the county. The passenger ferry is one of his pet projects and I knew he'd have the scoop. "The lease has been negotiated between the state and a boat company that's already in operations with passenger ferries," he said. "The boat will carry 147 people and comes with its crew. It'll be here by May 28th. The ferry division just has to market it, sell the tickets, and provide docking space." Bill said he really liked this scenario because it would allow NCDOT to "test the market" for a passenger-only ferry. "It's a great way to find out if it will be successful and I'm pretty excited about it," he said. Meanwhile, the county is full battery-charge ahead on the trams, which will start circulating in mid-to-late May. A new tram building next to the Berkley Barn will house the trams; two vehicles will be in circulation at a time with a third on standby with the ADA-compliant wagon to use as needed. Fast forward a few hours, and I get a call back from Tim Hass, who is the ferry division's public information officer. "We've been in contact [with a passenger ferry company], but there is no signed contract at this point," he said. "We are looking at every single angle, and leasing a boat is one of the avenues we're exploring." Oh, I said, Bill Rich made it sound like a done deal. "There is no signed contract," Tim repeated. "But everyone is working hard to deliver passenger ferry service as soon as possible. The ferry division, county officials, locals, and legislature are all working together." Tim also told me that work continues on the boat building project, with ferry division safety inspectors there for oversight. Later that same evening, Tom Pahl continued his remarks about the passenger ferry. After talking to John Torbett, who filled him with confidence that we're so so close to getting a boat here by May, he called Jed Dixon, deputy director of the ferry division. "Jed told me, 'Don't hold your breath,'" Tom said. "He told me it's still in negotiation, and he wouldn't talk about a timeline. It's concerning to me that Jed isn't fully informed about what the legislature is saying. He might just be gun shy." The Occupancy Tax Board agreed to meet on May 20th at 4pm to discuss tram funding. They hope to know by then if Schrödinger's ferry is alive or dead for the 2019 tourist season.